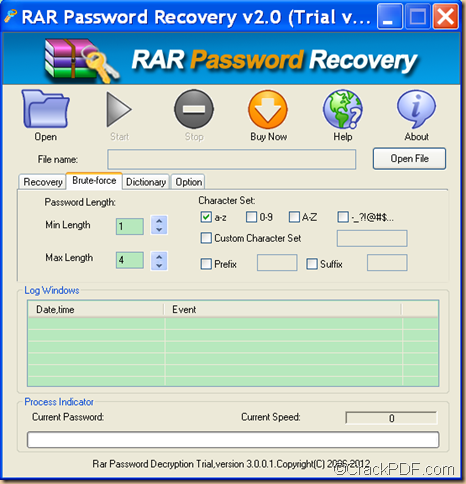 How to retrieve RAR/WinRAR password? 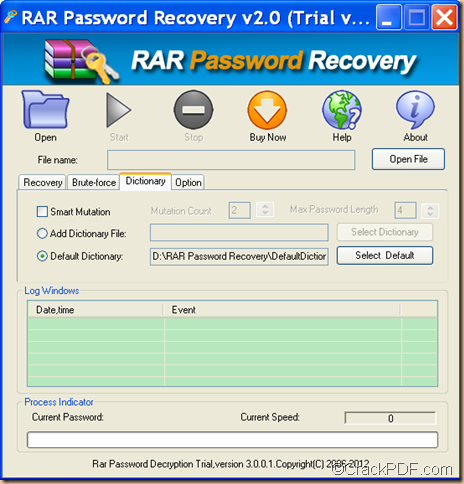 With RAR Password Recovery, you can easily retrieve RAR/WinRAR password and open the encrypted RAR files. If you want to know more details about it, please keep reading the following paragraphs. 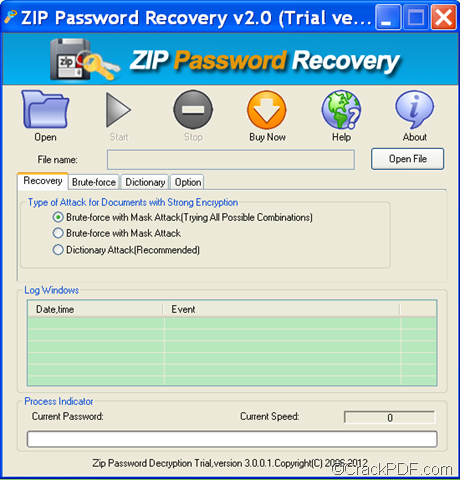 RAR Password Recovery is a smart and easy-to-use utility that can retrieve password for RAR/WinRAR achieves with Brute-force with Mask Attack (Trying All Possible Combinations), Brute-force with Mask Attack and Dictionary Attack (Recommended). The above three attacks are suitable in different situations. 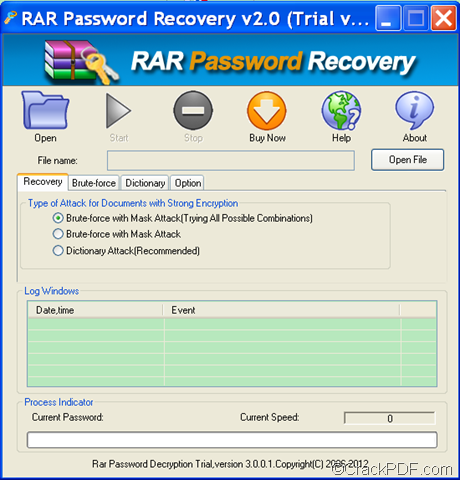 If you are able to recall part of the RAR achieve password such as the length of the password, character set, prefix, suffix, etc., you can use Brute-force with Mask Attack in RAR Password Recovery to recover the password of the RAR/WinRAR achieves. 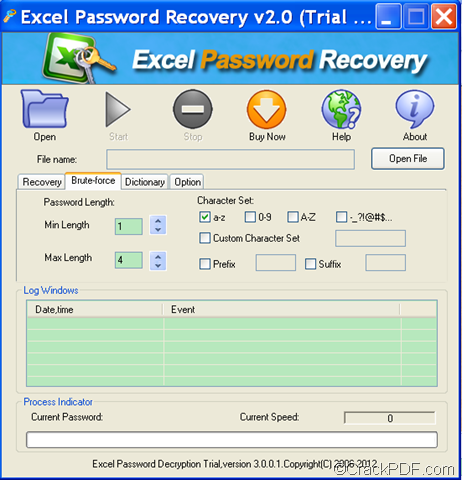 To install and run RAR Password Recover, please double click the .exe file in the download package and follow the setup wizard. To add the RAR/WinRAR achieve, please click the Open button or the Open File button on the main interface to browse and select the file. To use Brute-force with Mask Attack to retrieve the RAR achieve password, please check the radio button of “Brute-force with Mask Attack” in the “Recovery” tab panel.Then, please click the “Brute-force” tab on the interface to open the “Brute-force” panel. The following is a snapshot of the “Brute-force” panel. On this interface, you can set the maximal and minimal password length in the “Min Length” and “Max Length” edit boxes. You can also set character set, prefix and suffix. To start the password retrieval process, please click the Start button on the interface. 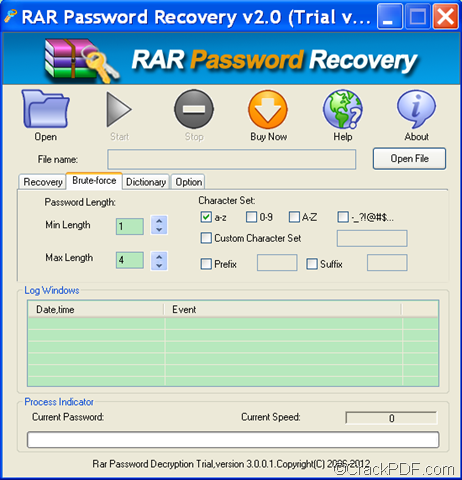 A status bar indicating the process of the RAR/WinRAR password retrieval will show at the bottom of interface of RAR Password Recovery. 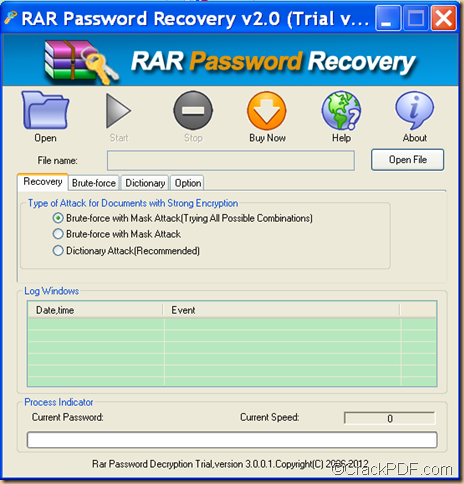 How to recover password for RAR/WinRAR archives? RAR Password Recovery can recover password for RAR/WinRAR archives. 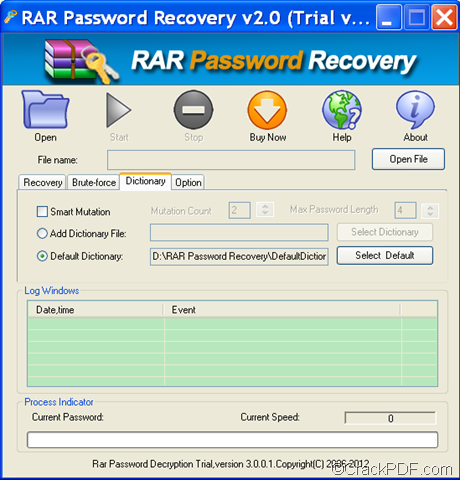 In this article, first it will make a short introduction of RAR Password Recovery.Then, it will show you the instructions on how to use it to recover RAR password. 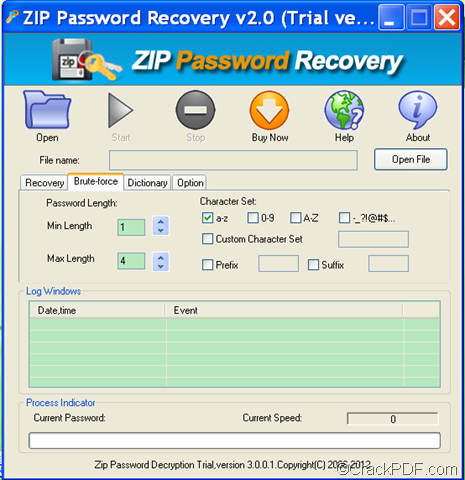 RAR Password Recovery is a professional password recovery utility that can retrieve password for WinRAR or RAR files. It can find back the WinRAR password with three options: Dictionary Attack (Recommended), Brute Force Attack with Mask Attack and Brute Force Attack with Mask Attack (Trying All Combinations). 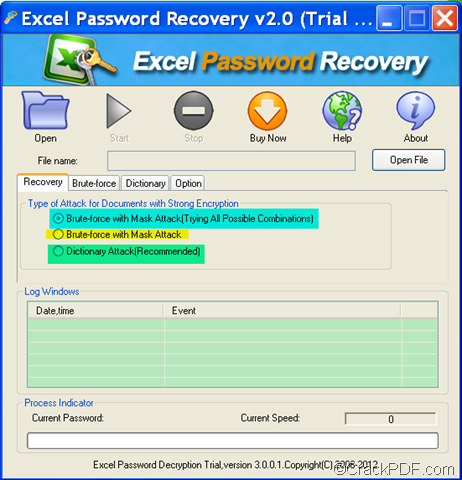 Choose a recovery option by checking the corresponding button of Brute-force with Mask Attack (Trying All Possible Combinations), Brute-force with Mask Attack, and Dictionary Attack (Recommended). If you choose to use Brute-force with Mask Attack (Trying all Possible Combinations) to recover the password, you can directly go to the next step. If you choose the other two attacks to restore the password, you need to check the radio button, and then click the “Brute-force” tab or “Dictionary” tab on the interface to set the related parameters to narrow down the password scope. 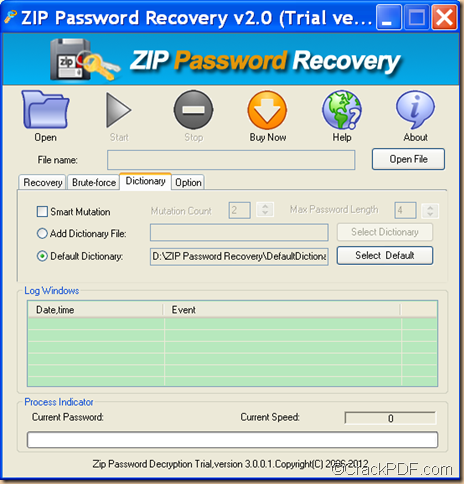 Click the Start button on the interface to start the recovery of the RAR password. 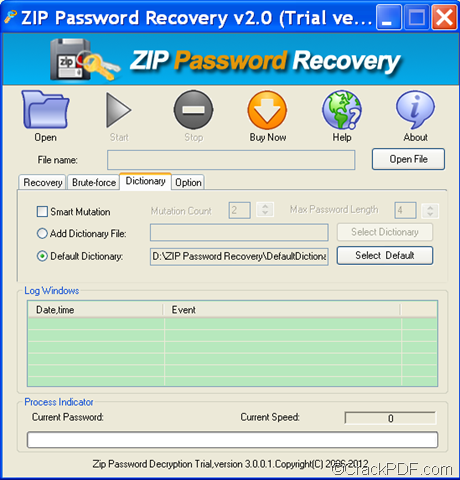 Then, RAR Password Recovery will begin to restore the password for the WinRAR archives. 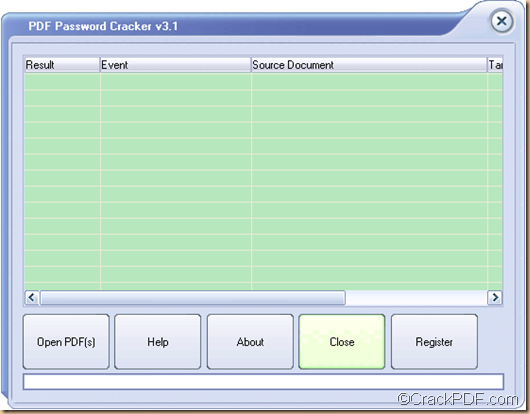 PDF Password Cracker helps you smoothly remove password from encrypted PDF document on Windows platforms. PDF Password Cracker enables Windows users to crack PDF password that protects the PDF file from copying, editing and printing. In other word, it can decrypt password protected Adobe Acrobat PDF files with owner password, which prevent the file from editing, printing, selecting text and graphics, or adding/changing annotations and form fields. Please download PDF Password Cracker and follow the setup wizard to install it on your computer. Double click its application icon on the desktop to launch it. Add the PDF file into the process file list by clicking the Open PDF (s) button on the main interface and choose document from the pop-up window. You can see it in the following figure. Choose an output location and set the file name for the decrypted PDF files in pop-up “Save As” window. This window is for saving only one file. If you remove PDF passwords for multiple PDF documents, the “Browse for Folder” dialog box will pop up. Click the Save button in the “Save As” dialog box to start to remove the PDF password. When the process is done, you can see “SUCCEED” in the “Result” list of the application, which means that PDF Password Cracker has successfully remove the password from the PDF document. 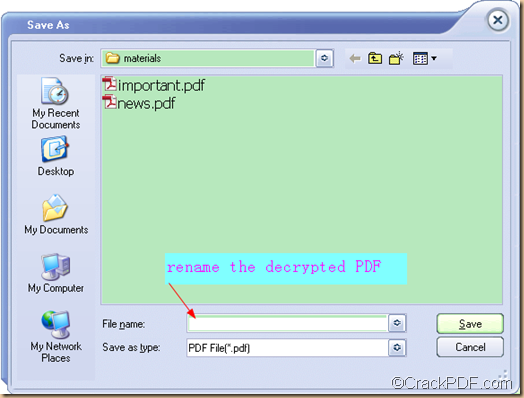 Then in the output location, you can open the decrypted PDF document and edit it with any kind of PDF editor. 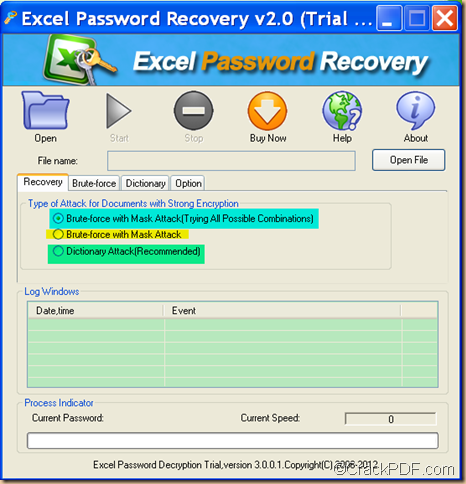 PDF Password Cracker is really a good assistant for those who want to remove password from encrypted PDF document. 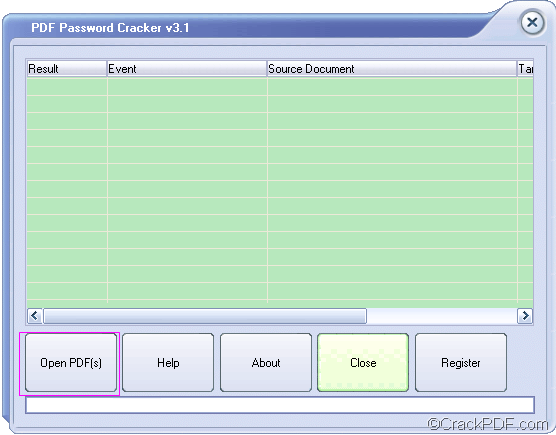 PDF Password Cracker can help you crack PDF password for a bunch of PDF files that are protected by a long and complex password when you feel inconvenient and boring typing them each time you have to open a PDF file. 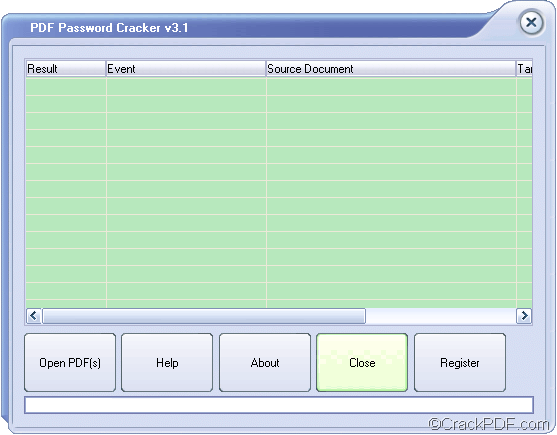 PDF Password Cracker is a practical utility that can help you remove password protection from encrypted PDF files without making any other change to the document. 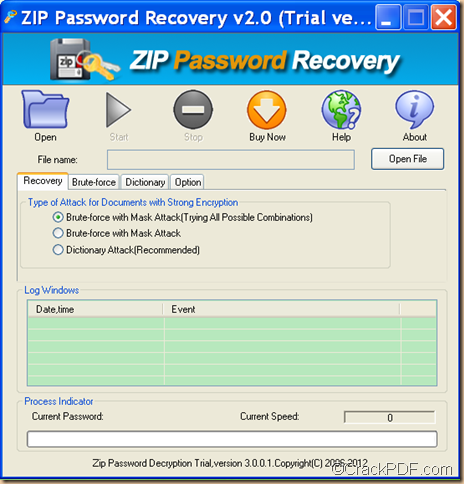 It enables you to crack the PDF passwords that protect the PDF documents from copying, editing and printing. It also allows you to crack the open password easily if you know the right open password. 1. Please download PDF Password Cracker, then double-click the installation package to install the app. After the installation, it will run and the following interface will pop up. 2. Please click the Open PDF(s) button on the main interface of the software to upload the encrypted PDF file. Then, you need to browse and choose the PDF file and click the Open button in the pop-up “PDF Password Cracker” dialog box. 3. Please rename the file when the “Save As” dialog box pops up. In the “Save As” dialog box, you need to select a destination folder and enter a new file name in the “File name” spin box for the decrypted PDF files, and then click the Save button in the “Save As” dialog box. the following is a snapshot of the “Save As” dialog box. 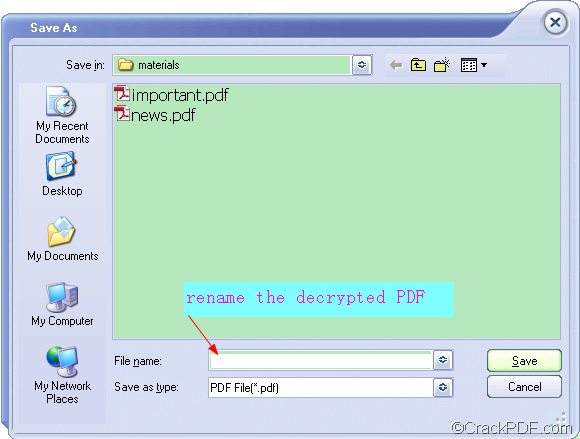 If the PDF file is only encrypted by owner password that prevents it from copying, editing and printing, PDF Password Cracker will instantly crack the owner password. However, if the PDF file is protected by user password, you may need to input the correct password, then PDF Password Cracker will crack the user password. You will see the status of the password removal is “SUCCEED” in the “Result” list of the application. You can right-click on the entry and click “View Target Document” in the pop-up list to open and view the decrypted PDF file. See, this is how to use PDF Password Cracker to crack the PDF password protection. It is pretty simple to use the app to remove PDF password restriction.